Today we’ll be covering what every man needs know about his wife. All by themselves, American women alone are the largest economy in the world, ahead of the second largest economy in the world…the nation of Japan. Women enjoy buying things to create attractive homes and make children and others happy. This includes giving gifts which most women love to do. For all this beauty and gift giving, women need to shop. Men find this hard to understand, but for women, shopping becomes a mix of challenge (finding the best buy), joy (discovering something a loved one would love) and need (the urgency of food and shelter). Women are not obsessed with money. It’s not the money they want. The beauty that money creates in their homes. The clothes, shoes and products that make them personally attractive as well as making the lives of their families more enjoyable. (Watch and listen to those who call in to QVC shopping channel for proof of this). The comments and admiration they get from friends and relatives. The reaction that children and adults have to a thoughtful gift they give. They want to know that everyone will eat, everyone has appropriate clothing and everyone can go out to eat, which women love to do because it brings them together. For women, Financial Security also means the same as when men think of the term. Women want to know that the family’s future has been secured because home, life, health, dental, disability, car and long term care insurance policies are all paid for. Their financial security also requires savings accounts and retirement funds. For women, Financial Security is the need to have these warm feelings that support their relationships. Take this away from a woman and you’re destroying one of her greatest needs. Men don’t understand women’s version of Financial Security. Men cannot understand women’s great interest in beauty or things such as owing multiple pairs of shoes when men have so few. Just like women make the big mistake of robbing their husbands from respect, men make the mistake of not supporting their wives’ need to create beauty and support their relationships. When men do this, they’re actually DESTROYING their wives’ financial Security. Because men can live without the things women call a priority, men make the big mistake of concluding that women should be the same way. In a troubled marriage, husbands often destroy their wife’s hope by not giving her the two greatest needs she requires, while the wife acts as if her husband’s needs just don’t matter. But what surprises me most is how SHOCKED they are when they discover that because they’re so busy trying to get their own needs met, they’ve completely overlooked their spouse’s needs. And they both totally unaware of it! This is the mystery need…the most complex one of all. Describing it with a single term is an illusion….it makes this need seem simple. But THIS NEED is FAR from simple. Emotional security requires a “secret recipe “with 5 ingredients that men very rarely understand. What further complicates this for a man is that women have NO IDEA how to explain their own need for emotional security to their husbands! Let’s look at the Key to a Woman’s Heart: The “Recipe” for Her Emotional Security. Now every woman has her own way to describe this but generally, she wants a man thinking of her not only when she’s NOT around, BUT ALSO…when she IS. When a man understands that thoughtfulness will make his wife truly happy, he will make her breakfast sometimes, take her out for coffee when she least expects it, notice that she is tired and take over some of her normal chores, give her surprise back rubs at the kitchen table, bring her home a relevant little gift on a Tuesday and so much more. This is a key part of her ability to feel emotionally secure. But do you know what’s ironic about this? All those things I described above are what husbands do when they’re trying to win over their wives in the first place….BEFORE marriage. It’s a mystery to men why they stop this behavior once they cross over the line of marriage. Women are not just into themselves but also their children, relatives, friends, pets, anything or anyone that can be cared for. When a man takes an interest in asking about any person she cares about and does it with CONCERN, she lights up like a Christmas tree. Let me break this down for men….In “man talk”. Caring for the people YOUR WIFE cares about is a big “turn on”. Think and talk positively about the people and things she cares about and you will be creating emotional security for the woman of your life. Everyone knows that women love to talk, but that’s not the part that women love. What they love is having someone listen with interest as they talk. Men make the mistake of believing that women are talking in order to communicate important information. THEY ARE NOT! Women do not talk for the purpose of exchanging information. That is just a side task. Women talk because they are wired to pour themselves into other people. They do that by talking and having a caring person listen to anything that comes out of their mouth. What a woman says is NOT the issue. This is NOT about “communicating”. When you as a man listen to your wife, you’re creating emotional security. Every time you listen and say “Oh, no kidding!” or “So then what did you do?”, you’re fulfilling one of your wife’s greatest needs by allowing her to, in effect, pour herself into you. Women want to feel PHYSICALLY safe. Part of what attracts a woman to a particular man is that he makes her feel protected. He will stand up for her against anyone who would hurt her. Even more important than being PHYSICALLY safe, women want to feel EMOTIONALLY safe. This is a tough job for a man. In order to find out how emotionally safe a woman is with her man, just check her “Safe Score”. 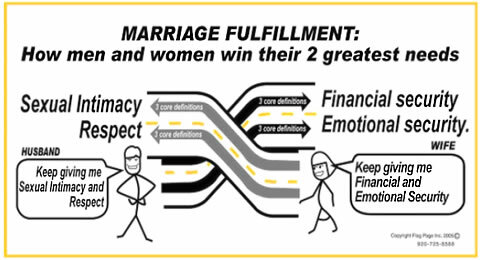 In my experience with couples, miserably frustrated women give scores of around 5% to 40%. A DISMAL average and a key predictor of the one million, five-hundred thousand divorces that happen every year in America. Women want their man to notice what they are attempting to do, trying to become and making every effort to improve. A woman wants her man to show that even her little attempts to be successful at anything (losing weight, dressing up, new hair style, cooking efforts, entertaining skills, gift choices, etc.,) are good, better and even best. When her man is constantly noticing her, he will look for things he can encourage no matter how small. In fact, the smaller the better. Thoughtfulness of her, of others, listening, safety and encouragement are the secret recipe that creates emotional security for a woman. While I was explaining a man’s 2 greatest needs and a woman’s 2 greatest needs, did you notice something? If you’re a woman, did you get that inner resentment churning against your man because he has been starving you of your Financial Security, Emotional Security or both? 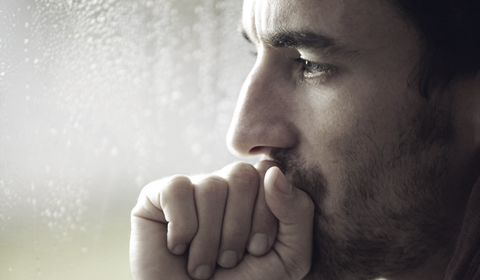 If you had these feelings, it is a confirmation and RED FLAG that you have driven far down the wrong road. Now it’s time for you take a whole new route. I hope this newsletter will be a wake-up call for BOTH of you. Which reminds me… if your spouse has already filed for divorce, or has even considered the “D” word, DO NOT “force feed” this newsletter (or any other materials for that matter) to your spouse. If he or she is not open to any kind of marriage help right now, ANY and EVERY effort you make to try to change their mind will be met with rejection which could make things even WORSE. People are only open to learning when they are ready. And if your spouse is not open right now, it’s up to YOU to save your family alone. (This IS possible. I am living proof that it only takes ONE to heal a marriage and I teach students how to do the same through my Environment Changer program. By now, you’ve learned that you each have VERY different responsibilities in your relationship. 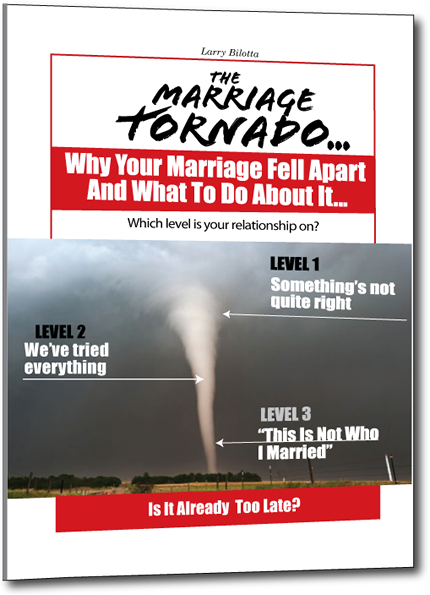 You must start meeting these needs if want to fix your marriage. Notice how both the man and woman are spending all their energy complaining about how their own needs are not being met. That wall represents the big obstacle they both can’t break through. Taking that wall down means you both must do something COMPLETELY DIFFERENT than you have been doing. You must take down that wall and build a “two lane highway” that flows in BOTH directions. Notice that the highway is flowing in both directions because of something called the “3 Core Definitions” that define each of your two greatest needs. There is now communication between husband and wife. There is now a clear path over what used to be a dead end. Building these two ‘highways’ will require both desire and work from both of you. The link below will take you to an article that will teach you how to discover your 3 Core Definitions for both of your needs. Once you’ve created these definitions, you’ll follow a specific “blueprint” over time so you can teach each other how to meet your 3 Core Definitions consistently. To get started, you’ll just need the article titled How A Man and Woman Can Find and Fulfill Their 2 Greatest Needs. Click that link and get your copy of the report. Once you start meeting your spouses needs, it will take on a whole new meaning because for the first time – in a long time – you’ll be acting selflessly and making sacrifices for your spouse.